So here are the pictures, a little delayed I know but better late then never, right? Well, I’ll get right to it. This is looking to the right as you walk into our front door. 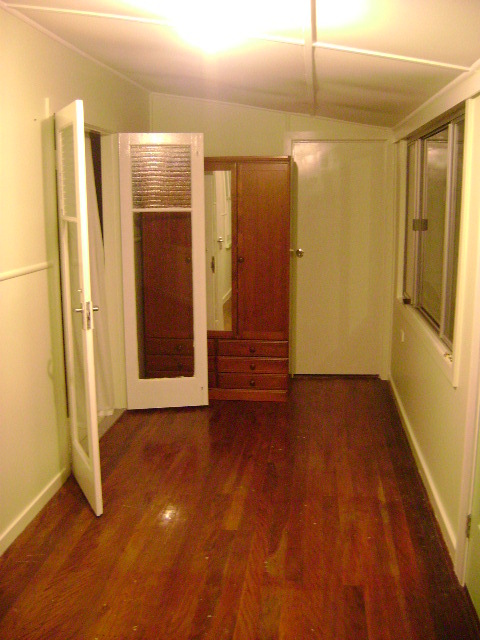 We have what is known as an old Queenslander. Houses built in early to mid 1900’s of timber. They are very well suited to our climate in times when there were no such thing as airconditioners! But as the years roll on, you will seldom find an original that isn’t adapted in some form or another. Example? 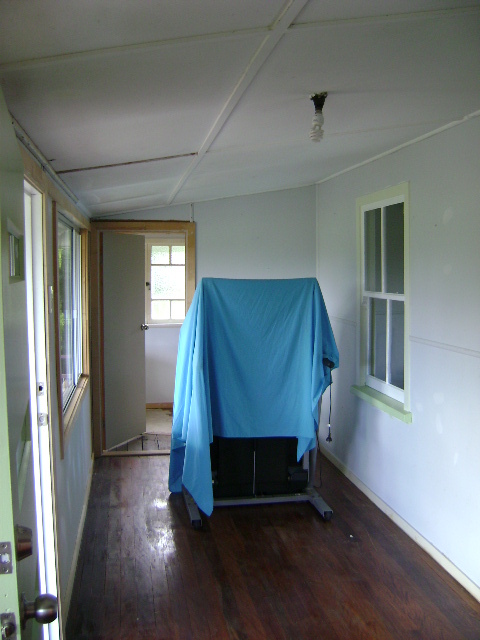 The room your looking at would have originally been a verandah to the existing house. 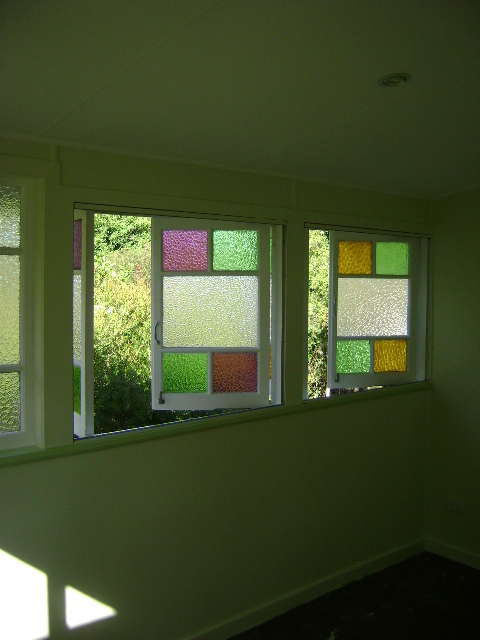 Built on the northern side to give the house protection from the harsh summer elements, yet allow for easy flow of air through the doors and windows. Generally the process goes a little like this. They add some side verandahs, just to catch a little more breeze and to really enjoy some good old Aussie out door time. Then comes the indoor kitchen and bathroom, WOW could you imagine the LUXURY! So they build in part of the side verandahs, just enough to not lose that barrier from the elements but with easy access out the side door. I mean the depression was starting to come to an end so people could afford improvements on the house. Really? What else would they do with their riches? haha. Then maybe an extra bedroom or two in front of that, for those growing families of the 60’s and 70’s. 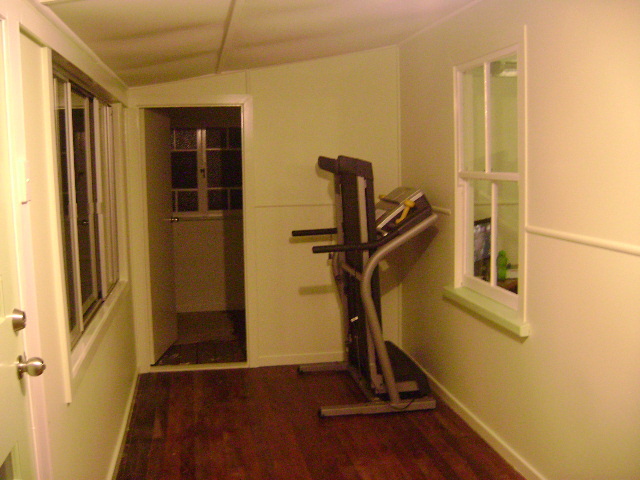 And finally the front verandah gets built in, for a little extra storage room. Then, it comes about time to add another verandah on the front to get back to that good old aussie entertaining. What you end up with is a bit of every era all rolled into one and a home with a history and a story to be discovered! Well, I’m sure you would have all figured by now I have a keen interest in Australian history and how places like this are built from the ground up, by many different hands. But back to more modern times and what these two hands have done! These are looking left from our front door. Yep that’s a big entry. Now for my favourite room. This one, I always thought would make a great space for …..well alot of things. I imagined setting up a small studio in here. 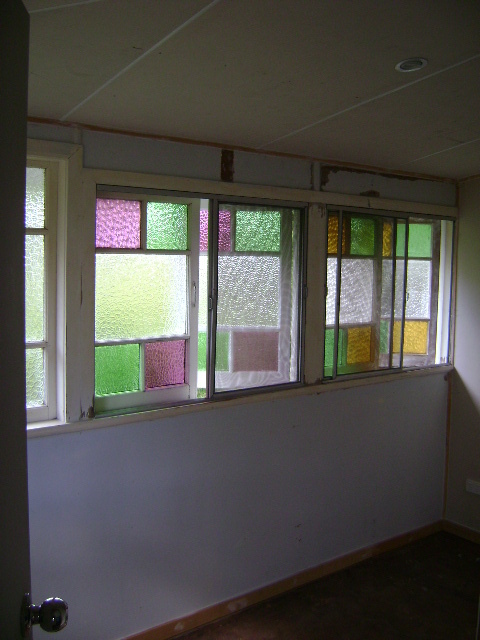 The light is fantastic, and how could those colourful windows not imspire you to create great things! Also in the years to come, it could be a great nursery, it is such a dear little room and I can just picture the Bentwood rocking chair, white wash bassinett, the bunting and quilts …………… oh sorry, back to reality. So this is kind of why it took me a few days to show you these photos, I had to find the right time of day to capture the light that adorns this little niech in our home. And the awesome end result. I guess I didn’t realise how much the time of day made a difference to the look of a room in a photo. But even reading other blogs for inspiration, it is something that can make a real differance! Well, one last pic of our front door, just love how it finally looks at home. I painted it some time back but it always looked somewhat out of place from the inside as the rest of the room was incomplete. Our Front Door. Looking very at home. Filed under Old House, The beginning. So close, but no cigar! I may have had a bit of a slow start this morning, well? It is sunday! So after a mammoth day Friday and a full day babysitting yesterday, I only had the arcitraves, skirting boards, windows and 1 door to paint. 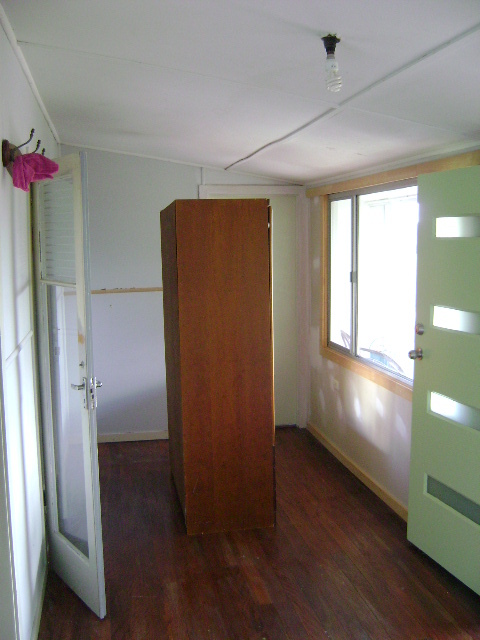 But I am talking two rooms worth and thats; around 7 windows, 6 doorways, 3 pairs of bay windows and a door! Yeah that’s right, what was I thinking, haha. Well I am nearly there and am seeing the light! Just one more coat on the skirting boards and some arcs. Then I promise I’ll celebrate with some great after photos. Of coarse, I don’t have to worry about redressing the room as the house is pretty much empty now. No spare room furniture, no office furniture. But, our house in Quilpie is getting quite full! Before I go on, I’ll share some before pics with you I took the other day. 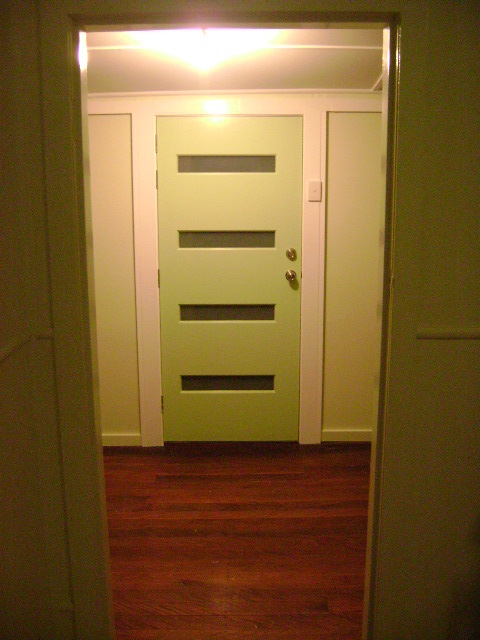 Front Entry Towards Bed 4. Don’t mind the bulky furniture in centre shot, I’m a little lacking in man power so moving things to the middle of the room is about the best I can manage. But you can see what I’m talking about. Sooooo many windows and doors! Enough about this place, I’m starting to get really excitied about our new house! While it may only be a rental property, so no renovating for a little while. There are still plenty of homly touches I am looking forward to making around the place. But before I get there, I am entrusting James with placing out all our furniture. Well, except the “pretty stuff”, so he calls it, which pretty much entails anything that weights less then 10kg and isn’t furniture or whitegoods. Gotta love him. But normally when I am going to do something like moving into a new place, I just walk around the empty space picturing where eveything might go. I’m not the only one who does this right? It’s all part of getting the feeling of the place and how your going to make it into your home. So, due to the fact that James was already living some 888km’s away with friends while he started his new job. And I had work here until last week. 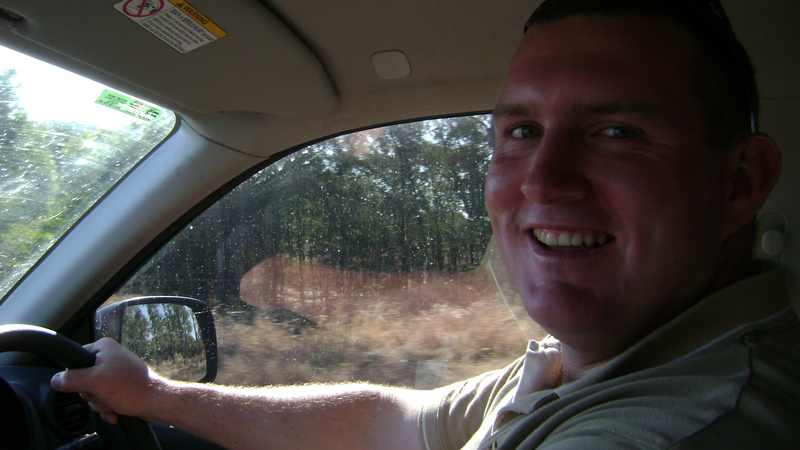 When we got our new house in Quilpie about a month ago, James was able to move in straight away. With his job allowing him to have RDO’s he was also able to come back and forth getting loads of furniture and making the move smoother rather then rushed. But the point I am really trying to get to is……… James lives our new house in Quilpie which now has 80-ish-% of our furniture in it AND I have never even seen it! It’s really a bit strange, I don’t know where to call home anymore? Once I have finsihed all this painting and given the place a good sprucing up. We will once again reside in the same house! Yay! AND…. have a home again! Double YAY! 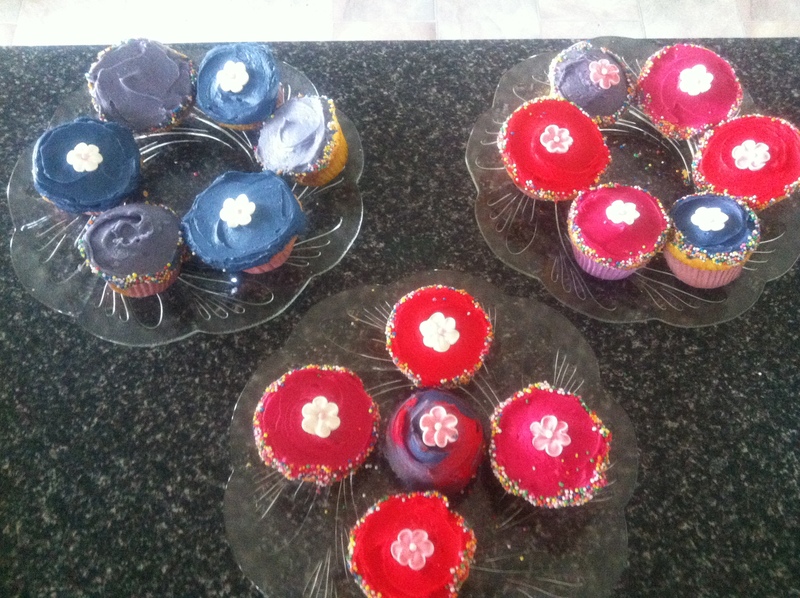 Before I get too carried away in my day dreams, I’ll leave you with a picture of the Yummy cupcakes I made with my best friends little 4 year old, Georgia yesterday. We had a ball making them and her mum loved them! So it seemed like today was quite a successful one! After posting some no-longer needed items for sale yesterday, One of them had already found a new home! Only about 15 more to go. But after looking after my little nephew all morning, as he was not feeling well enough for day care. My work has begun….. I finished emptying out the cupboards in out sunroom and the prep has started. Not that it was really great weather for it as it was quite FREEZING here today. Maybe not to some but I’m a girl that likes my sunshine and cheery days. Not when it’s blowing a gail, and it’s got a really icy note to it. Though I’m thinking that’s something I’m going to have to get used to with the impending winter and our move increasingly west! So back to my busy day, it’s looking improved on since this morning so I’m happy. Won’t share any pics yet, you’ll have to wait ’til I’m finished. 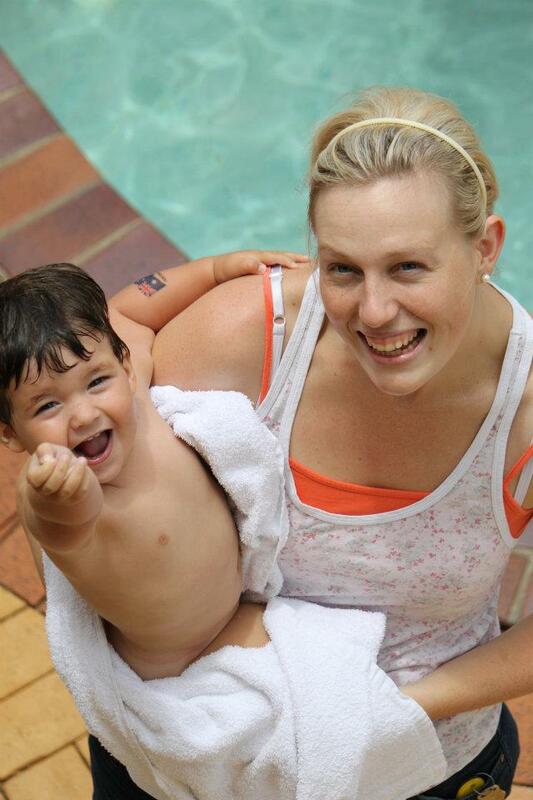 But i will share a cute pic of my little nephew on one of his better days, when it wasnt too cold to enjoy the sunshine and some pool activities. So, after writing a fantastic blog last night about what we do when were alone and how we deal with it….only for me to delete it in the process of trying to add in a picture, (hopefully i’ll get this down pat soon). I decided to give last night a miss and see what the day brought before starting a fresh tonight. I am realising with all this spare time on my hands (well, except for that increasing to do list), that it becomes quite a decision as to what my day holds. When you come from working full time, which is never just 38hours, well, I guess most decisions are made for you. Do you want to come out tonight? No, I have to work in the morning. Do you want to do tea? Yeah, but I might be late, got a busy day at work. When do you want to catch up? Well, I can only do this day! And by the time you add in everyone else’s schedule, it gets hectic! We really have become TOO busy….. doing NOTHING. We live in a fairly small town, about an hour from brissy. We have both lived around the area most of our lives. Our families are here, our friends, our work. But do we really think about any of that. I think some time back, though I’m not really sure when, we just stopped making decisions. You go to work, you come home, cook dinner, do some house work, watch the tele and off to bed. And what for, to do it all again tomorrow. Then the week end comes, or what little of it we actually have together around work, and all of a sudden after that sleep in you’ve been waiting all week for and a quiet day. Well look at that, it’s monday again!!! SO WHY DO WE DO THIS? That’s what finally made our decision…………our lack of decision making!!! Or as some would like to call it, quite possibly A RUTT. Well, goodbye rutt and hello world. We look forward to having a life, each week and each minute that goes by is one we will never see again. It’s been said a million times but we really do have to take every moment for what it is. Don’t dwell, but move forward (sorry, no julia supporters here) carry on. 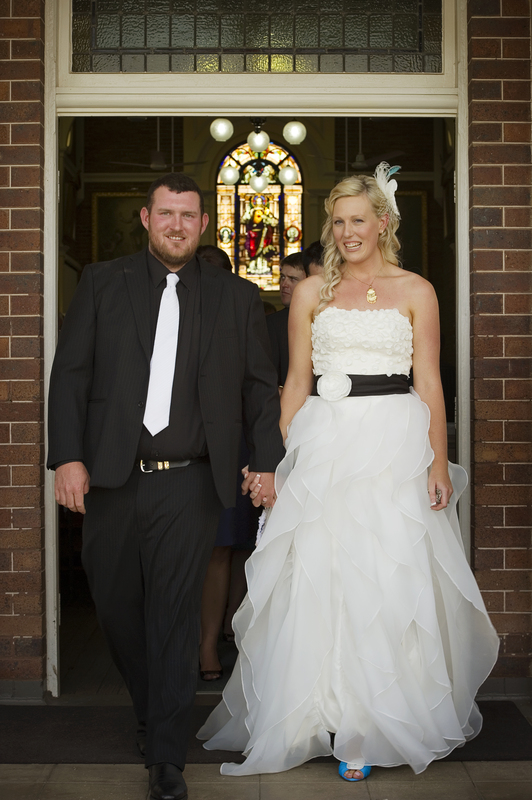 This was a massive step for us starting our married lives but I know it will be a defining moment in our lives. Don’t worry, I’m not living in fairy land, it won’t be easy but it certainly will be living and that’s what lifes all about, the big decisions! Finally I will leave you with a picture of my wonderful husband that I was trying to upload last night when it all went horribly wrong, lol. I took this piccie as we were taking off on one of our serious road trips north. Back in our pre rutt days, lol. So, while this is all about the journey, I have to admit, it’s kinda already started. So I guess a little background? Well I’ll start with US. James and I (Suzy) are madly in love and after 6 years finally got around to getting hitched. Yep that was our day! And what a great day it was. So fast forward 6 months and here we are. At this present moment sitting in my lounge room, on the ottoman, in a rather empty house! James? Well he is in little old Quilpie town. Yes Quilpie. It’s in western Queensland, Australia. So why am I sitting in an empty house? Because up until today I was working full time and living in our old house, whilst our belongings are slowly being packed up and relocated to our new house, in Quilpie. So from today I have about 3 weeks to Paint/Pack/Sort! Meanwhile I am jobless and temporarily husbandless, so naturally it’s the perfect opportunity to start this blog and share our journey with all of you in this happy blogging world!! Well thats my start, will catch up a little more tomorrow.